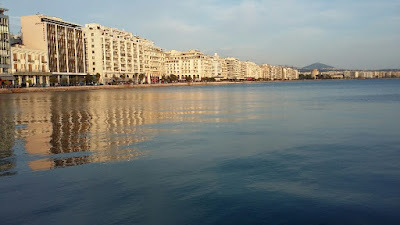 Just back from a few wonderful sunny days in my favourite Greek city, Thessaloniki. My first visit here was in 1966 when I came from England to visit my Greek relations with a scant knowledge of Greek. I have written many wailing accounts of how much the city has changed. As we grow older we tend to live more and more in the golden, halcyon memories of our past and the delight of first encounters. Thus we feel deeply indignant when places we love alter with time and so-called progress. I miss the open fields and the little red tiled roofs and white houses round Kalamaria where my cousins had their homes. 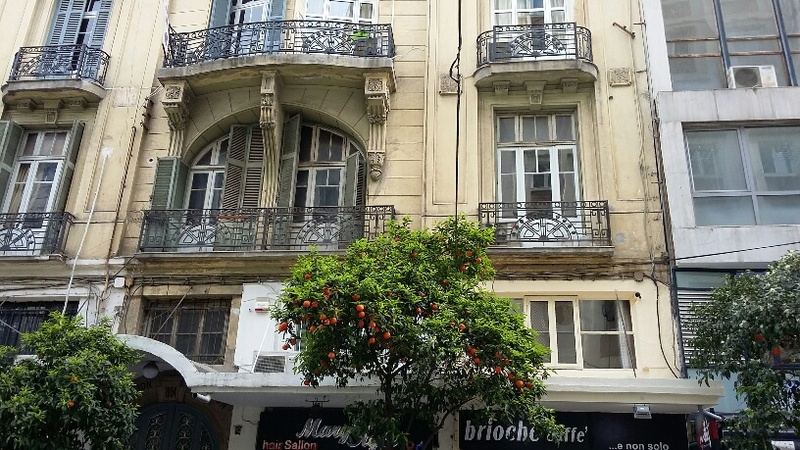 The houses were small and toilets often primitive but they were cool and airy, marble floored, with beautiful wrought iron doors, sheer curtains that covered windows to the floor like bridal veils, stirring gently in the breeze of open shutters. At lunchtime, the women went to the baker's to collect the meals they had taken there to cook in his hot ovens; delicous makaronada, moussaka, imam bayildi and papoutsakia. People sauntered past as one sat replete with these good things, sunning on the little balcony and greeted one cheerfully. Ladies gathered in the afternoon in the cool of a porch and sipped coffees and gossiped, relaxing after their morning toils. It had character and it was Greek. Now these houses in Kalamaria have been demolished as the old owners died and their children raised high blocks of flats in their place. It's true the flats are spacious, well equipped, modern, beautiful but they now look like any city suberb in Spain, Portugal or Italy. No character. I can no longer see the church where my daughter was baptised one Easter Sunday, nor the sea in the distance where we used to go and bathe. People feel estranged and older folks are lonely, an occurrence that always seems to occur when people live in high rises. I go there and feel lost and sad. Only the fig tree remains in the cemented road, a tree planted by my cousin many years ago. Well, these are grumbles I have frequently aired and I understand perfectly that my younger cousins are far happier in their comfy, modern apartments! Even the Kalamaria I describe is nothing like the place described in the many letters which I read when researching my book The Long Shadow. In those days it didn't exist as more than a scattered village and the beach at Aretsou was filled with unhappy Greek migrants from Asia Minor who lived in tents and squalid conditions. So many would say things had progressed wonderfully! 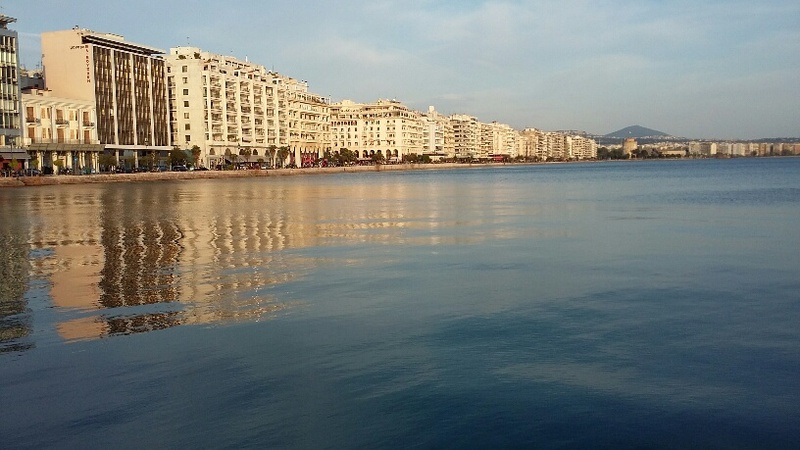 As for Thessaloniki as a whole, the first encounter for nurses and soldiers arriving during the First World War was of a very small city circling the beautiful horseshoe bay of the Thermaic gulf. Minarets vied with churches and synagogues then and the beautiful villas of the rich Jews lined the waterfront. The city in 1916 was only just liberated from four hundred years of Ottoman rule and not yet predominantly Greek; Jews and Turks formed the main population. But the Greek numbers swelled rapidly when the afore mentioned refugees from the Greek lands of Smyrna arrived after The Great Catastrophe (as the Greeks still call it) The ancient lands of Asia Minor fell to the Turks and now form part of that country. A terrible fire ravaged the city in August 1917 which destroyed most of the Jewish quarter and many of the the lovely waterfront villas. Very little of the older architecture now exists, not even the attractive apartments and other planned vistas erected after the fire. Just as we experienced in London after our own great fire in 1666, many wonderful schemes were dreamt up to renew and beautify the city but few ever came to fruition. However, Aristotelous Square remains the beautiful heart of the city, leading to the waterfront road Leoforis Nikis. It remains charming, open and interesting. There are many interesting excavations to see and the city has been named cultural capital of Europe in its day with an annual Fair in September and music, film and art festivals. Meanwhile the waterfront is packed with bustling cafes, wine and cocktail bars, packed solid with youngsters every evening and all weekend. The Greeks still perambulate along the waterfront (Paraleia) as they did in the old days, taking their Sunday stroll with the family, flirting boys and girls meeting up and enjoying the sunshine and sea breezes. But I miss those old days so much.